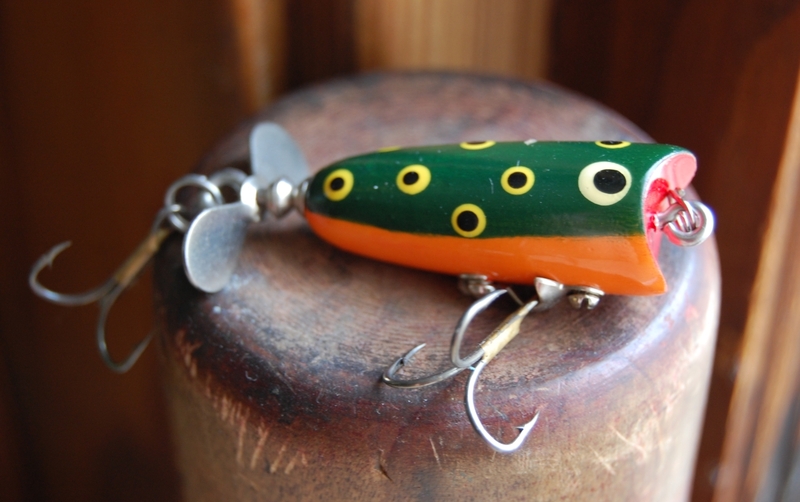 Is there such a thing as a Roycroft fishing lure? It is really enjoyable making these. I can make cooler looking lures than I can buy and I can modify them to suit the places where I fish. My lures work great – they catch a ton of fish. It’s also a kick to open my tackle box around the guys knowing that they don’t have any of the lures that I have. One thing that has always been annoying to me about lure-making is having to buy the metal hardware. This spoon lure looks fantastic in the water. It darts and flashes like a drunk little bait fish on an underwater jet ski! I took it out in a sunny area where the water was murky and got a bite on the second cast. This is a great working lure. 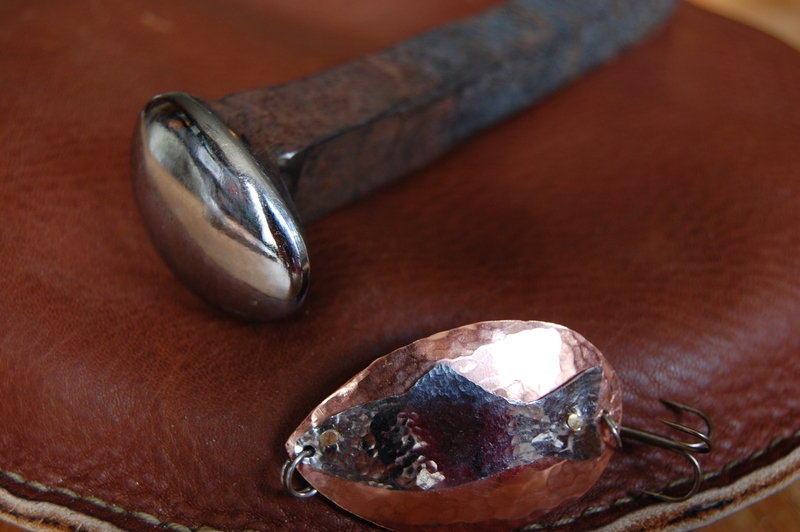 The copper was supple and simple to form and hammer mark. I cannot say the same about the stainless steel. I have not worked stainless before like this and it was not friendly. I will have to do some research on annealing stainless before I make the next lure. I riveted it all together with brass pins cut from 18ga wire. All in all, this was a really happy afternoon’s work and it gave me an excuse to go fishing (you know, purely research purposes, so forth, etc…). If you have any questions, or for goodness sakes, if you have advice about how to anneal stainless, I am all ears. 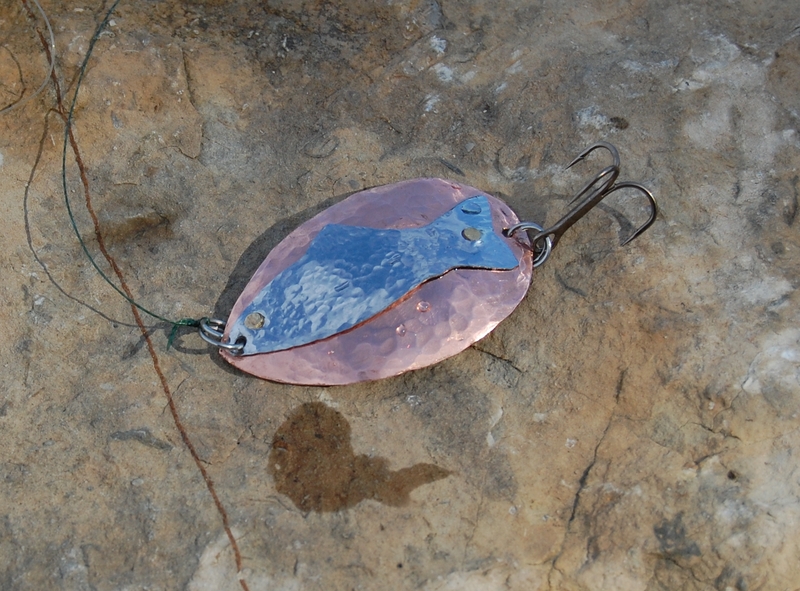 This entry was posted on August 2, 2010 at 2:38 am and is filed under Fishing Lures, Forging, jewelry, metalwork, Raising Copper, Tool Making. You can follow any responses to this entry through the RSS 2.0 feed. You can leave a response, or trackback from your own site.